A super simple recipe for a healthier version of the famous Rocky Road, involving just a few ingredients! The base for this recipe is a raw chocolate made using coconut oil, cocoa and chocolate whey protein. Coconut oil is rich in heart-healthy good fats, while raw cocoa is high in antioxidants and the whey provides an extra protein boost. To turn this into a Rocky Road, we then throw in marshmallows and dried fruit for sweetness and add chopped nuts and Protein Crispies for the crunchy biscuit effect. Protein Crispies are small crunchy balls made from whey protein and rice flour, and you can can get them from MyProtein. They add a great crunchyness to the Rocky Road, but if you can’t get these, you can simply substitute them for more chopped nuts, such as chopped almonds or pistachios. PS: If you want more insanely easy (but healthy) recipes like this one, make sure you download our Free Recipe Pack. *Remember, you can substitute the add-ins above for any combo of dried fruit and/or nuts you like! Melt your coconut oil over a low heat — you want to get it just warm enough to melt completely, but no hotter (if your coconut oil is already in liquid form, then you can skip this step). Add the chocolate whey, cocoa powder and sweetener to the melted coconut oil and mix it all together until smooth. The mixture should resemble melted chocolate. Throw in all of your chosen add-ins and stir through to distribute them throughout the chocolate. Pour the Rocky Road mix into a rectangular mould (preferably a silicone mould, as it can otherwise be difficult to remove later!). Place in the freezer and allow to set for approx. 1 hour. Once the chocolate has fully hardened, remove it from the mould and cut into bars or squares. 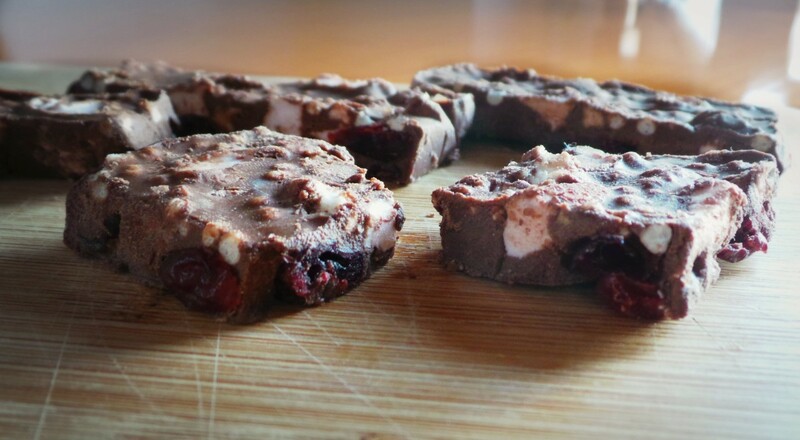 Keep your rocky road chunks in the fridge and enjoy!